I have certain dishes that I am very picky about. Some may call it biased. Some may call it snobbery. I just call it taste. 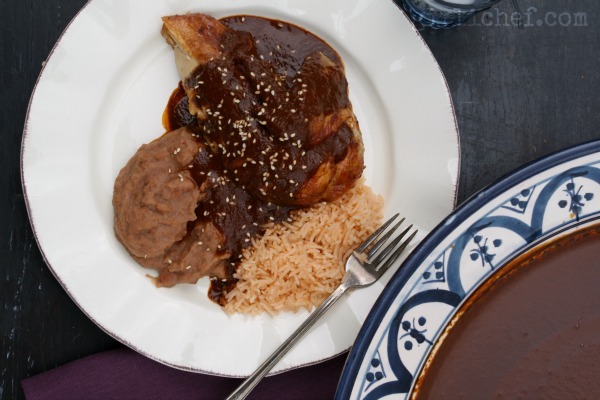 Mole is one of those dishes. Now, I almost hate to admit that the mole I like more than any other is my own. Ha! But in all fairness, the recipe originally came from Rick Bayless. I've only adapted it slightly here and there over the years. Maybe it's because it was "my first". I mean, first love sets the bar, right? 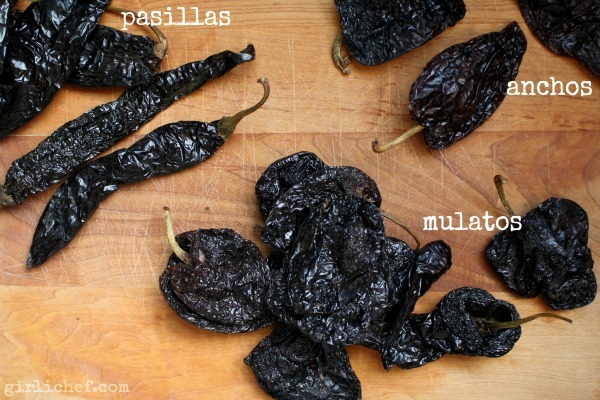 Okay, that's not to say that I haven't enjoyed many other varieties of mole. Made by an equal variety of people. There's just something about that version that keeps me dreaming...remembering...craving. I'm not alone, either. My family feels the same way. Immediate and extended. I get requests every year around Thanksgiving and Christmas for a jar. That's just usually the time that I make it. You see, a really good mole takes time to develop those complex layers of flavor. 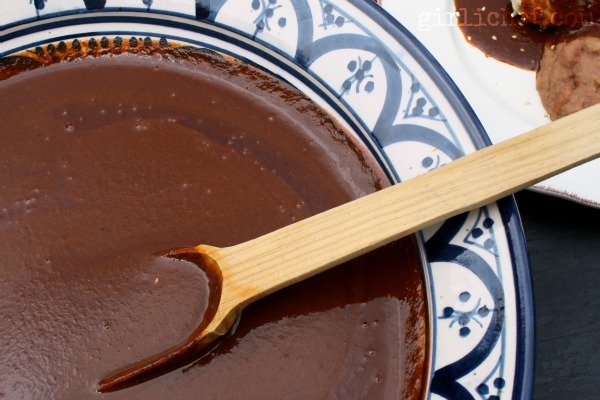 Chiles, nuts and seeds, tomatoes or tomatillos, dried fruit, spices, flavorful broth, (pleasantly) gritty Mexican chocolate, bread or tortillas - they all play their part in that medley. But time plays an equally important role. And, if you judge by the look of my kitchen on mole-making-day, so does a big, fat mess! Let's not forget the (ahem) warmth that fills the kitchen...and eventually the whole house...when a pot is simmering for the better part of a day over an open fire. So worth it, but precisely the reason that it normally gets made in the wintertime around here. So, this mole is not the one I've been yammering on about. HOWEVER, it is extremely close. And I made it on a day where the thermometer outside my kitchen window registered 80+ degrees. Without breaking a sweat. Believe that. You know why? (Of course you do, it's in the title of this post. Humor me.) Because it's made IN A SLOW-COOKER! So now I can comfortably make mole in the heat of the summer. I'll admit it's not quite as good as my first love, but it's really close. And the fact that the mess is basically non-existent compared to my dream-mole, I'm almost willing to overlook that. Plus, with a few tweaks, I believe I can come even closer. 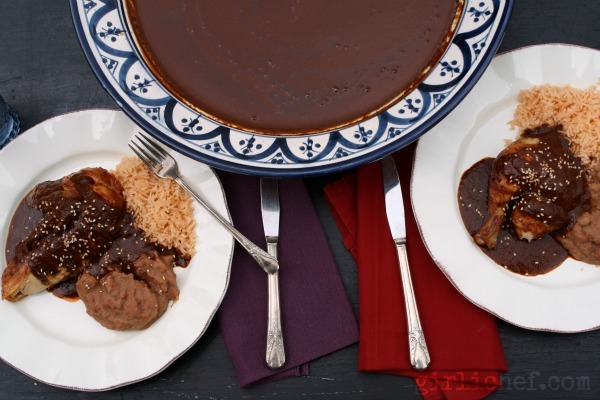 Deep, rich Mole Rojo made in a slow cooker. You have two options to start this mole on its journey - if you have a slow-cooker with a removable, fire-safe crock, great. If you don't, do this first part in a large pot and transfer to the slow-cooker. Heat the oil in the bottom of the pot over high heat. Once hot, add the chiles, garlic, almonds, and raisins, stirring slowly and constantly for about 5 minutes or so. Th inside of the chile pieces should turn lighter, the garlic will be a light golden, the raisins will be puffed, and the almonds will be well toasted. Add the tomatoes and their juices, the ground spices, the bread, and the chocolate, and continue to stir for another 2 minutes or so. Add 2 cups of water, the brown sugar, and about 1 1/2 teaspoons of salt. Stir and bring to a simmer. Transfer the pot to the slow-cooker base (or pour into the slow-cooker), cover, and cook on low for 6 hours. Scrape all of the mole base out of the slow-cooker and into a bowl. Add half of the mixture, along with 2 cups of the chicken stock the jar of a blender and blend until completely smooth. This could take a few minutes depending on your blender. Set a fine-mesh strainer over your slow-cooker crock and pour the mixture in the blender through, pressing to release all of the base, leaving the chile skins behind. Repeat with second half and 2 more cups of chicken stock. Stir 3 more cups of the chicken stock into the pot, cover, and cook on high for 2 hours longer. At this point, the mole should be the consistency of a cream soup. If it seems too thick, add in some of the remaining cup of chicken stock to thin it out. Taste, and adjust seasoning with about another 3 tablespoons of brown sugar and a teaspoon or so of salt. Serve hot over chicken, turkey, pork, or eggs. We love it with carnitas and grilled chicken leg portions, as well. I also love it with just queso fresco and hot corn tortillas. If serving with chicken or turkey, sprinkle with a smattering of toasted sesame seeds. One serving is approximately 1/2 cup. Store in a jar or container with a lid in the fridge for 5 days or so. I think I'm going to add 2-4 ounces of toasted sesame seeds and some roasted tomatillos with their juices to my next batch, so that it comes closer to the flavor profile of the "regular" (non-slow-cooker) version of mole that I love so dearly. 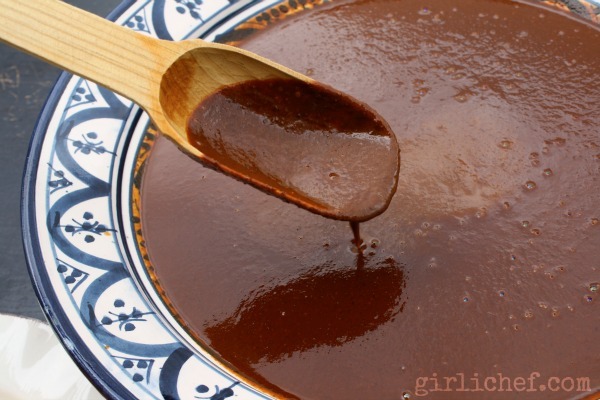 Though this may not have quite the depth of flavor that a mole whose ingredients have been toasted and ground individually, and simmered over a slow fire has - the lack of mess it makes in the kitchen may be enough for me to make this version quite often. Plus, it doesn't heat up the kitchen.